Don't rush to upgrade on Wednesday without backing up. 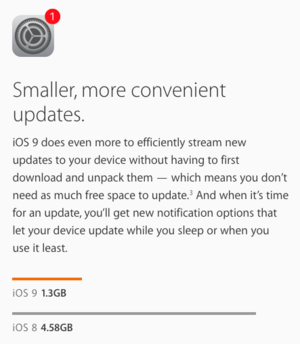 iOS 9 officially launches Wednesday, bringing huge changes to iPhones, iPads, and iPods. But before you rush to upgrade, take some time to get your device ready. That way, if anything goes wrong during the install process—or if you decide you hate iOS 9—you can reverse your decision without losing any important files. The good news: You won’t have to delete a whole bunch of apps to get ready to upgrade. Why? The new OS will do the deleting for you. Apple said at June’s Worldwide Developers Conference that iOS 9 will take up 1.3GB of storage—way less than iOS 8’s space-hogging 4.58GB. If you’re using a 16GB phone and don’t have any room to spare, iOS 9 will delete apps and then reinstall them after the update is done. Read up on all of iOS 9’s big features and then get ready to install on Wednesday with these tips. First thing’s first: Make sure your data is backed up. No one has ever regretted backing up their data. Ever. You can use two methods, iCloud or iTunes on your computer, or for extra security, you can use both. Let’s walk through both options. Back up to iCloud You can initiate this in two ways. The first is to connect your device to your computer, launch iTunes, select the device in iTunes, click the Summary tab, and in the Backups area enable the iCloud option. The other is to choose to backup to iCloud from the device itself. You do this by going to* Settings > iCloud > Storage & Backup* and in the resulting screen enabling the iCloud Backup option. An alert appears informing you that your data will now be backed up to the cloud. Tap OK to allow that to happen. Back up via your computer To do things the old-fashioned way, launch iTunes on your Mac and plug your syncing cable into both your device and your Mac. Select your device in iTunes, choose the Summary tab, and in the Backups area of the resulting window click on Back Up Now. If there are apps on your device that aren’t in your iTunes library a window will appear asking if you’d like to back them up. The choice is yours as you can always wirelessly re-download any apps you’re missing from the iTunes Store, but restoring them to your device will happen more quickly if they’re being copied from your computer rather than being downloaded over a slowish broadband connection. iTunes will now back up any apps on the device that aren’t in your iTunes library, plus the rest of your data. Either way you choose to back up, once you’ve installed iOS 9, you’ll have all of your photos, apps, and other data stored safe and sound. Don’t get stuck using an OS you can’t stand—be sure to have a copy of the latest version of iOS 8 compatible with your device. There are invariably cases where people wish they hadn’t upgraded—perhaps because an app they rely on hasn’t yet been updated for iOS 9 or, as it turns out, they hate change (or their older device runs more slowly with the new OS). If you act quickly, you can put things back the way they were. Here’s the deal: Apple “signs” versions of iOS. This tells the device that the version you wish to use is OK to use with that device. While that version is signed, you can install it on your iOS device—even if it’s a version of the operating system that’s earlier than the one you just installed. However—and this is very important—Apple traditionally stops signing old versions of iOS just a day or two after releasing major updates (such as iOS 9). If you were to update to iOS 9 say, a week after it ships, you might find that you can’t go back to iOS 8. The Mac will delete this files under certain circumstances so you may not have a copy of the latest one. If not, launch your favorite web browser and search for “download ipsw.” You’ll find a number of sites that offer links to the file you need. Just be sure to choose the correct one based on the device you’re using. Remember, this window stays open for a very limited amount of time, so you’ll have to act quickly if you want to get back to iOS 8. Stay tuned for our complete guide to downgrading from iOS 9 to iOS 8.